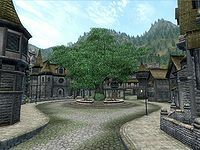 While not much is known about the town's early history, Chorrol has housed a chapel to Stendarr since at least the First Era. The position of Archbishop of Chorrol was filled by one Vincius Imbrex by no less than 1E 1051.. An academy exists in Chorrol, but very little is known about it. The city has had a focal point for merchants in the shade of an oak tree since the Second Era when it was known as "Little Oak Place". According to some sources, Varen Aquilarios was the Duke of Chorrol before Emperor Leovic's decriminalization of Daedra worship caused him to take up arms and usurp the Emperor in a long and bloody war, though other sources state he was the Count of Kvatch. After being defeated at Fort Ash, Varen took control of the Legion of Chorrol which routed Leovic's troops into the Heartlands, paving the way for the Colovian Estates to unite and fight under his dragon banner. Chorrol was significantly affected by the Soulburst in 2E 579 when earthquakes ruptured the ground, splitting the town and leaving a gaping fissure infested with flame atronachs that killed Doran, the town's prefect. Wooden walkways were erected over the chasm but the noxious fumes caused many to fall to their deaths while crossing. Many buildings, including the Great Chapel, were damaged or destroyed by the constant earthquakes, with the Oak and Crosier inn resorting to nailing furniture to the floor..
As of 3E 433 the city was divided into five main districts: Fountain Gate, Castle Chorrol, Chapel Street, West District and the Great Oak Place. and the town was protected by thick walls and guard towers. The ruler of Chorrol at this time was Countess Arriana Valga, widow of the hereditary Count of Chorrol.